The state of the Caspian Sea environment and ecosystem depends on atmospheric circulation above its water area. To ensure hydrometeorological support to the activities of the Framework convention for the protection of the marine environment of the Caspian Sea, the 17th CASPCOM Session recommended creating an information resource describing changes in atmospheric circulation above the Caspian Sea. This catalogue should be considered as the first attempt to implement this decision. Atmospheric circulation parameters – mean (Gm) and maximum (Gmax) value of meridional and latitudinal gradients of atmospheric pressure (G), standard deviation (Sg), occurrence of different circulation types (С). All the abovementioned parameters are calculated for the water area in general and for separate sea sectors according to the data of daily meteorological observations carried out 4 times a day (00, 06, 12, 18) at 8 points located on the sea coast (Fig. 1). Observation data posted at http://cliware.meteo.ru/meteo/ are used as source materials. Fig. 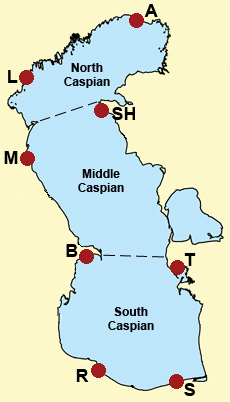 1 Map of the Caspian Sea indicating its different sectors and hydrometeorological stations which data are used for the preparation of the Catalogue (L – Liman; A – Atyrau; SH – Fort Shevchenko; T – Turkmenbashi; S –Sari, R – Resht, B – Baku; M – Makhachkala. Wind speed values (Sw, Wm, Wmax, W0,1,W5) are calculated as follows: for the North Caspian (NC) - according to (L-A-SH-M) data, for the Mangyshlak Threshold (MTH) – according to (M-SH) data, for the Middle Caspian (MC) according to (M-SH-T-B) data, for the Apsheron Threshold (ATH) - according to (B-T) data and for the South Caspian - according to (B-T-S-R) data. Meridional gradient of atmospheric pressure (MG) is estimated by (LA-RS) data, North Caspian latitudinal gradient (NCG)- according to (M-A) data, Middle Caspian latitudinal gradient (МСG) – according to (M-T) data, South Caspian latitudinal gradient - according to (B-S) data. Circulation type (northern, southern, western or eastern) is determined depending on the gradient of atmospheric pressure. 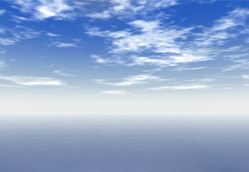 The parameters of regional atmospheric circulation are subdivided into two big arrays: the parameters of ground wind fields and the parameters of atmospheric pressure fields at the sea level. Both arrays contain basic and derived parameters. To open and download catalogue tables click . At the moment the Catalogue covers only several past years, and it is regularly updated with the new data. However there is a chance to extend the Catalogue to comprise the historic data for the past 25 - 30 years, which will require additional time and effort. We expect the Catalogue to become a new information resource to study not only the impacts of atmosphere on the sea, but also the interrelation of global and regional atmospheric circulation.